My story began with a search inside the famous Google, its grey strip begging me to ask my question, to give it a task. I did so with two words: “Frankenstein manga.” What was to follow only betrayed my expectations. I found fewer than 10 titles–only 6 titles–that involved the moody fictional character, Dr. Victor Frankenstein, and the monster he created now called Frankenstein. From these 6 measly titles, I thought half of them would be in English being that Mary Shelley’s Frankenstein was in English, and so, many Western readers would also enjoy them in their origins’ native language. To my dismay, all 6 Frankenstein titles were unlicensed manga. “How could I ever wish to write about these without guiding readers to scanlations and pirated websites?” Of course, I found no answer waiting at my fingertips. “How could these manga creators do this to me, to other faithful followers?” I complained, but a thought struck me as devastatingly as lightning. Manga creators simply make the stories, not publish and translate them into other languages. Editors, letterers, and translators only followed their duties. So who, if anyone, could be to blame for allowing these 6 titles to remain on the lab table, only to be viewed by 125 million Japanese speakers when there are 360 million English speakers? Surely readers can’t be to blame. Complaints aside, I felt that manga lovers were done a great injustice when titles that have been poked, prodded, and even robbed by many go unnoticed by manga publishers. “‘Live, and be happy, and make others so,'” Justine Mortiz in a dying whisper. The first of the Frankenstein children to stay in Japan’s lab is Wagatomo Frankenstein. Born in 1972 in Shueisha, Wagatomo Frankenstein is an elusive child. Even in the smokiest alleys of the cyber world, its real story is hidden from English speakers, thus we move to its siblings. Wagatomo Frankenstein‘s sisters, Franken Fran (fathered by Kigitsu Katsuhisa) and Mondlicht: Tsuki no Tsubasa (fathered by Juichi Iogi), are still housed under Akita Shoten’s label, but they have gained a cult outside their imprisonments. Franken Fran uses a female version of Frankenstein to grant the wishes of hapless humans in rather unwishful, Pet Shop of Horrors ways. The junior of the sisters, Mondlicht: Tsuki no Tsubasa, bears little resemblance to Mark Shelley’s Frankenstein–it’s simply a battle waged between lonesome vampires and Dr. Frankenstein’s monsters who take the form of pretty schoolgirls. *As of 4/29/2015, Franken Fran has been licensed by Seven Seas Entertainment and is slated for release in February 2016 in omnibus editions. Thank you, Leslie! Along with Franken Fran and Mondlicht, three brothers have joined the Frankenstein manga family. Similar to most human families, the eldest brother takes its name from the father: Frankenstein. Despite being younger than Wagatomo Frankenstein, Junji Ito’s creation is the closest to their mother’s children, Dr. Victor Frankenstein and his monster’s awakening. The second brother, Embalming: Another Tale of Frankenstein, comes from the 2007 Jump SQ generation, born from Rurouni Kenshin creator, Nobuhiro Watsuki. If Dr. Frankenstein truly lived and he assembled his grotesque monsters, Embalming shows how these undead beings run amuck in Europe 150 years after Dr. Frankenstein’s original creation. I must say, though the baby of the brothers is a Korean webcomic, it mimics its elder siblings, right down to the typical high school premise. Noblesse from Son Jae-Ho has Frankenstein, a devoted scientist who follows a vampire lord, operating a prestigious academy. Though this Frankenstein offspring has his scientist father’s brain, its history is completely warped. He has made himself into a monster and granted himself immortality in completely following his master’s wishes. However much I seem to know about these 6 titles, I have yet to read their copies within legitimate terms. I had hoped that several publishers would need these titles in English to appease the cults who follow them. With my confession now in front of the whole world, I can find solace. I and these manga creators have re-told Mary Shelley’s story. I hope English manga publishers would like to hear them. 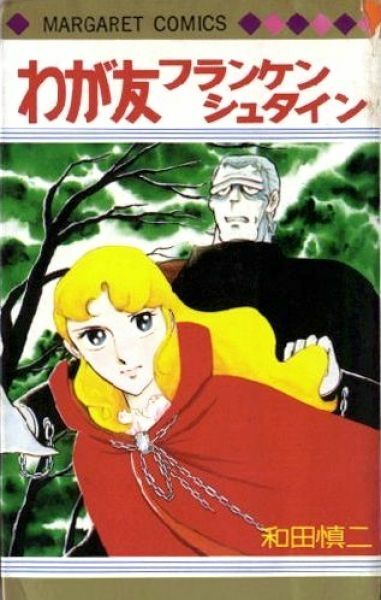 This entry was posted in Books (本), Japan (日本), Manga (漫画) and tagged Embalming: Another Tale of Frankenstein, Franken Fran, Frankenstein, Mary Shelley, Mondlicht: Tsuki no Tsubasa, Noblesse, Rurouni Kenshin, Wagatomo Frankenstein. Bookmark the permalink.